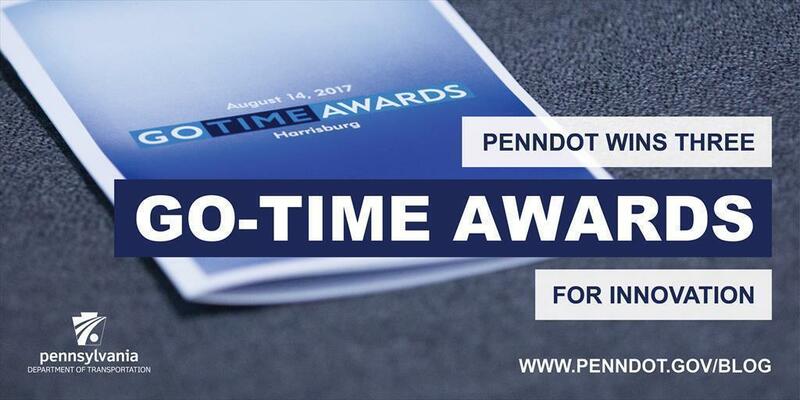 The Wolf Administration recently recognized PennDOT with three GO-TIME Awards, which recognize initiatives that improve state government operations through cost savings to taxpayers, efficiency gains for employees, and better customer service to the public. Colleagues, co-workers, senior leadership and the Governor's Office of Transformation, Innovation, Management and Efficiency (GO-TIME) nominate employees for the awards program. A panel of experts reviews the nominations and selects the most outstanding for recognition. Sealing asphalt during the day requires 20 full-time crew members due to heavy daily traffic volumes – and causes more congestion for motorists. PennDOT highway maintenance staff in Montgomery County, however, successfully completed a pilot program for overnight operations, completing 300 miles of roads and exceeding their goal by nearly 100 miles. By working an alternate schedule of four, 10-hour shifts and developing a custom lighting system, the maintenance can be accomplished with just 10 crew members. The foreman of the crew was instrumental in obtaining support for the concept by highlighting benefits to maintenance employees such as cooler working temperatures, a safer working environment due to less traffic and longer weekends. But the initiative benefits motorists, as well, since the work is done at night when fewer cars are on the road. The pilot has resulted in inquiries from other county offices interested in adopting the method. Forty percent of all vehicle registration renewals in the Commonwealth are done online through the PennDOT Driver and Vehicle Services website. Previously, online customers had to print a temporary document only valid for 14 days and wait to receive their permanent registration card and validation sticker in the mail. In 2017, PennDOT implemented an update to state law that eliminated the requirement for registration stickers on vehicles. This change facilitated the ability for Internet customers to print permanent registration credentials from their home printers. This enhancement saves PennDOT more than $3 million in mailing and product costs annually. Additionally, customer feedback on this new process has been overwhelmingly positive. Together with the Department of Environmental Protection, PennDOT developed an iPad app that enables DEP staff to conduct electronic inspections of surface activities at oil and gas sites. Similar mobile technology apps have previously been successfully deployed by PennDOT to its field staff to reduce costs and increase efficiency. The DEP app makes the inspection process more accurate and efficient, thanks to improved data quality, easier photo documentation, elimination of duplicate entry, electronic supervisor approval and other features. Previously, staff completed paper forms and then entered information into a database. Electronic inspections also mean citizens can see surface inspection results sooner, with results posted online within days rather than weeks. With the recent addition of sub-surface inspections, DEP anticipates a 20 percent increase in productivity, along with reduced errors and inspector and manager reviews. This initiative also has been selected as a finalist by the National Association of State Chief Information Officers (NASCIO) for its 2017 recognition awards. In all, eight initiatives were recognized (PDF) with GO-TIME awards. GO-TIME works with state entities to modernize government operations to reduce costs and improve services. State agencies saved more than $156 million during the 2015-16 fiscal year and Governor Wolf challenged GO-TIME to build upon this success by achieving $500 million in savings by 2020. To learn more about GO-TIME, visit www.governor.pa.gov/go-time.